1. Pantherinae (tigers, lions, jaguars, and leopards). Also known as the big cats. 2. 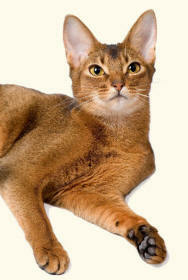 Felinae (domestic cats, cougars, caracals, servals, lynxes, ocelots and [sometimes] cheetahs). Cats’ claws are protractile, but often (incorrectly) described as retractile. At rest, the claw is retracted; muscular action (contraction) protracts the claw out of the sheath, rather than retracts it in. The cat is classified as a subspecies of the Wildcat (Felis silvestris), in the genus Felis, and is referred to by its biological name Felis silvestris catus. It is also called by its taxonomic name Felis catus. The domestic cat has an anatomy similar to other felids, including sharp, protractile claws. The term domestic cat is also used (by pet associations) to mean a cat that is not purebred (non-pedigree cat).